Many families in Canberra will celebrate Easter this year by exchanging gifts with family and friends. Often these gifts are chocolate-based, which means sugary snacks will be ‘on the menu’ for several days. Many children hoard their chocolate goodies and consume them slowly—meaning the sugary treats may last for weeks! While chocolate is delicious, the danger is that it contains sugar, which can be used by the bacteria on teeth to make acids. The presence of plaque acids on teeth is what dissolves tooth enamel and ultimately causes decay. So snacking on chocolate every day increases the time that sugars are in contact with teeth, which in turn increases the risk of enamel dissolving and decay developing—something parents should be concerned about. The Australian Dental Association (ADA) has expressed concerns over the increasing intake of sugar by Australians (did you know that we are among the top 10 countries for per capita consumption of soft drinks in 2006?) and several campaigns have been launched to call for the reduction of sugar intake especially in schools. 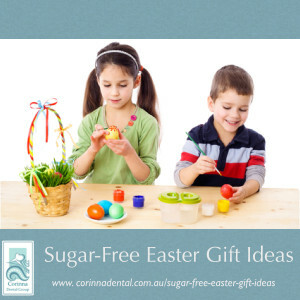 Some dentists have been known to include tooth brushes in Easter gifts to loved ones: granted, this sometimes causes a little eye-rolling, but parents often appreciate that their child is reminded to brush by someone other than themselves! If you can find a rabbit or chicken-inspired toothbrush holder, you might get away with giving a toothbrush without hearing too many groans! Of course you can still include a sweet treat or two. We will share some suggestions soon around how to help your kids manage their Easter chocolates in order to maintain good oral health. Have a safe and happy Easter celebration!